Denisha Bland ’13, ’15 MEd, assistant director of Frontier Set initiatives, mentors students during a weekly Spartan StartUp workshop. 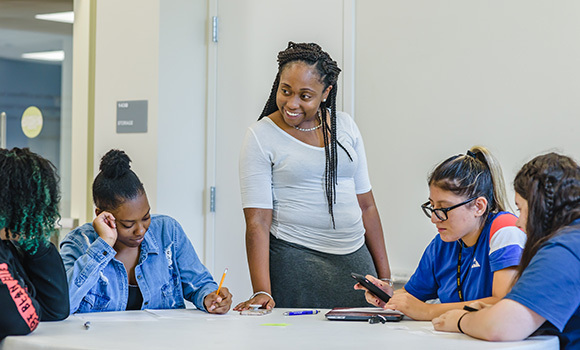 This summer, 42 Spartans got a “head start” on college thanks to Spartan StartUp, UNC Greensboro’s new five-week summer bridge program for first-year students who come from historically disadvantaged backgrounds. The program’s goal is to prepare students for academic success and to help ease the transition to university life. Participants received individualized academic support and advising, participated in co-curricular and recreational activities and developed a strong network of peers, faculty and staff. 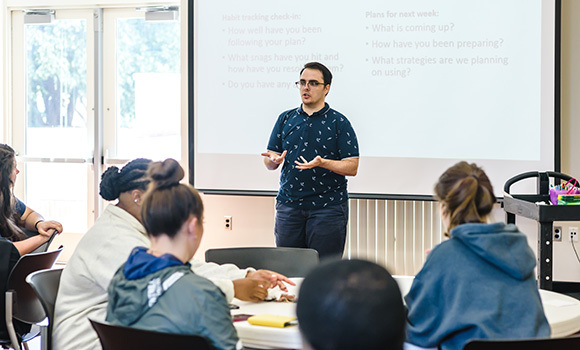 Shawn O’Neil, assistant director of Tutoring and Academic Skills Programs, helps students develop academic skills and learning strategies during a weekly workshop. The courses, which fulfill a general education requirement for students, included an online component to better prepare students for online learning. All students – many of whom are Pell Grant eligible – were provided with laptops that will be used throughout their time at UNCG, thanks to a UNC System grant. 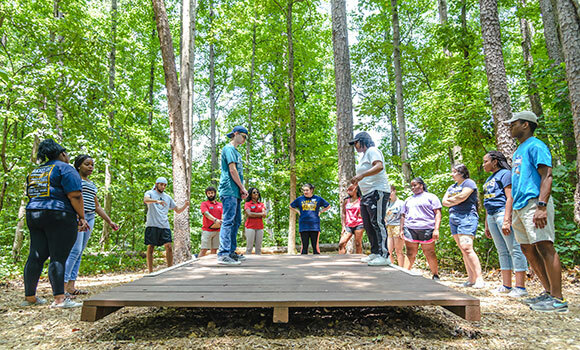 Spartan StartUp students participate in team-building activities led by UNCG’s Team Quest staff. For Brandon Totten, a Greensboro native who plans to double major in media studies and English, the program has helped him develop a community of friends and mentors that support and encourage him. He also formed good study habits that will be critical to his success. 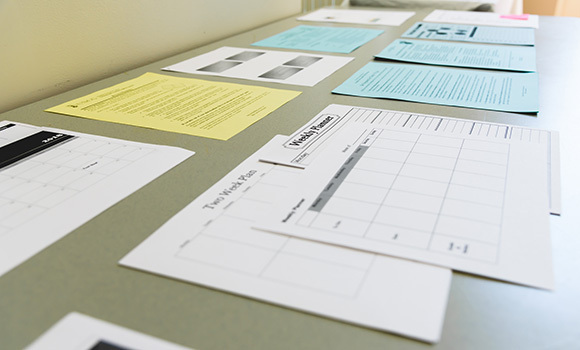 Over the course of the five weeks, students developed time management and planning skills using weekly planners and other materials. The program continues throughout the year, with Spartan StartUp students living in the same residence hall on campus, as well as taking general education classes and participating in co-curricular activities together. Spartan StartUp is a Frontier Set initiative supported by the Bill & Melinda Gates Foundation. Participation in the free program is by invitation. To learn more, click here.